Yesterday was all about toughening up pastel, but today I'd like to embrace its sweeter side. I think it's possible to wear pastels in a way that looks feminine and soft, but still age-appropriate and sophisticated. One of my favorite pastel shades right now is mint green, and I love the way it contrasts with navy blue (my current favorite neutral #navyforever). 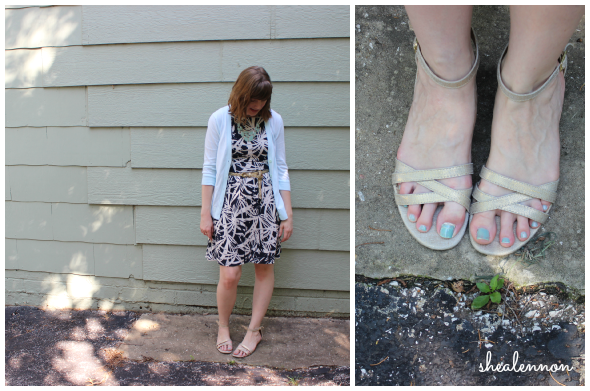 I combined my mint cardigan and necklace with this palm print navy blue dress, and I think it keeps the sweetness of the pastel while still looking modern. I've worn this dress, which has a fun cut-out back, to a couple of weddings this summer, but with a cardigan it becomes work-friendly as well. You know how much I love a piece that can do double-duty. How do you dress down a party dress? Once again I got Jona in on the photo-taking action. He had a pastel shirt of his own that he wanted to show off. Toddler style blogger in the making? I think so. Linking with "Mint to Be" at The Creative Closet, On Trend Tuesdays, Bloggers Who Have Inspired Me, and Make-up Mix Up. 5 years ago: wearing light, summery neutrals. 1 year ago: wearing white jeans two ways - for work and weekend.